1. Select the field on your form to highlight it then click the GEAR icon. 2. 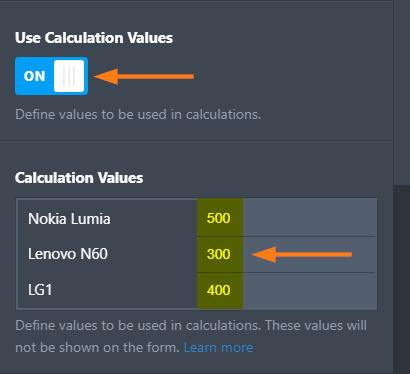 Go to the OPTIONS tab and toggle the USE CALCULATION VALUES option to ON. 3. Below that option will be a 2-column table showing all the options on the left and a corresponding blank column on the right. This is where you will type in the respective calculation values for each option. ...in one go. And that's it - The changes are automatically saved. NOTE: For the Dropdown Field, the first option must always be zero. This represents the first empty value of the Dropdown field. How do I get the $ to show in price field? Is it possible to set the assigned calculation values as subscription plans? If so, what are the steps to go about it? When I paste a set of values to one single choice field, then paste another set of values to another single choice field, the FIRST single choice field updates to be the same as the SECOND. how do i make the form make the choice unavailable once a certain amount of people have chosen this field. Very confusing to me. What I need instead of the field choice name showing up on a spread sheet down load, I just need a character, ie 1 to show up for each choice made. Can you show how to do this for a dummy? I want a number 1 to be downloaded to my excel spreadsheet, so I tried to put a simple 2-1= that didn't work, tried to put a 1 value in but that didn't work either. What do I do? We are trying to include a user supplied option so what value do we fill in the Calculation Values if we don’t know what it is. Is there something to fill in so it will pull the value from whatever our user enters? If the value of time in a date time field is between 8-5 I want "normal hours" auto selected in the next question, else "after hours" would be selected - how can I do that? how can i manage the calculations, pls? No, I was talking about something else that I used once in my form. It is a calculator that allows to summarize the chosen options. For example if one class has been chosen, it is one price, if two classes have been marked, the double price appears automatically. How do I get this number to Multiply with another input? If I had one question asking how many items, then how do get it to multiply with another question which asks about price? How can I get the calculated value to show in an excel report? It is not totaling is there something I can do? I am trying to calculate results of multiple check boxes within each field (page) in for form calculation widget, but the final result is not showing properly. As a result, everything gets messed up. Kindly help. Hi! Just wanted to know. How do we show calculation from numeric field values: I mean I have field1 and field2 and I want to show the result as field1/field2. Sabe me dizer como criar este tipo de formulário? Apologies for the lack of response by the team. We tend to focus on questions in the forums or via email. 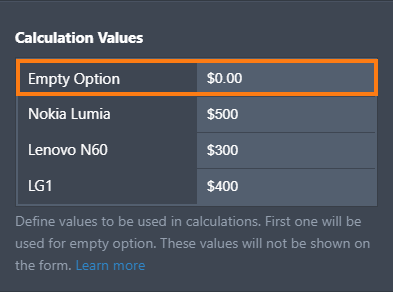 Is there a way for these calculation values be sent in the Notifcation email, instead of the option names? Nosotros necesitamos valor de calculo pero nuestros productos no se calculan por unidad , sino por metro cuadrado, (m2) por medida alto y ancho. ¿Se puede calcular?, si es asi digannos como por favor. Is it possible to have this lesson in french ? How to show the "PRICE" field as the demo..? NVM just got it to work, thanks! Pasting the values doesn't work - it just pastes all the values into the first option. Is there a specific way these are supposed to be written or just like you showed in one column? I have them written out just like yours (please see below) and it's still not working. I added calculation values for each of my multiple choice selections...now how do I make it so that my customers can see their total? this update causes big problems when you have a long list. Before you could just copy and paste in one operation. Now if you have a lot of options me and you edit the options list frequently it is a real nightmare since when you delete an option the value does not become deleted but shifted to the next option. When you delete an item the values do not automatically associate correctly. This is ridiculous and obviously released without consultation or bug checking. This does not work on my form, anyone know why this maybe despite doing everything they have mentioned? Looks like the Calculation values got a facelift UI and it's now very difficult to update them... Is there any way to bulk copy what's already in there? The new dropdown "add calculation value"style is REAL BAD! I'm unable to copy-paste entire rows of data from my spreadsheet! Having to do it one by one is impossible as I've a lot of data there! Please revert to the old notepad style or better make a switch for two input styles to be used at our leisure. Where can I see the final calculation value? This is not working on my form. I have the values populated under properties > surveying but when I make my selections they don't output. Do I need to add a field for them to output to? If so what element do i add. Is there anyway for the calculation to copy the exact value of the calculation value instead of rounding up? ola fiz tudo certinho coloquei os valores e não está funcionando. I'm looking to create values in which someone can choose three options for a price, with an additional 40 dollar charge for each item chosen after that. Can someone help me with that? Hi, can I read the values ​​in a spreadsheet from Google sheets instead of writing them in text form? So that they can be filled and modified automatically. Similarly: can I link a form text to a cell in a Google sheet spreadsheet to show a result based on what is completed in the form? Hola, puedo leer los valores de una hoja de calculo de Google sheets en lugar de escribirlos en forma de texto? De modo que se puedan llenar y modificar automáticamente. Del mismo modo: puedo vincular un texto del formulario a una celda de una hoja de calculo de Google sheet para mostrar un resultado en base a lo que se completo en el formulario? How can I design beautiful interactive calculation form? Can I have a form field that does calculations?